In order to achieve efficient performance in a bandsaw machine, proper bandsaw blade selection is required. Choosing the proper bandsaw blade will help increase accuracy and speed up production output. For tough or abrasive sawing applications, or if high surface finish quality is critical, then a carbide-tipped bandsaw blade is recommended. At SawBlade.com, we recommend using the Haltbar CT 1002 Triple-Chip carbide bandsaw blade. This saw blade provides quality output in the most demanding production cutting applications where standard bi-metal blades fail. The Triple-Chip carbide bandsaw blade provides high-resistance cutting capability for difficult-to-machine metals, exotic metals, and alloys. These blades are designed to cut through tough materials. The Triple-Chip features teeth ground from high-quality, micro-grained carbide cylinders welded to a tough, ductile backing material. A ball of carbide is welded in a pocket that is milled into the tooth tip and then ground to blend with the tooth shape. A unique design feature that offers the toughest resistance cutting in bandsaw blade products. The positive rake angle allows for faster penetration in high production cutting environments. Its carbide-tipped teeth increase wear resistance when cutting high temperature alloys that cause hardening and wear on ordinary bi-metal or carbon blades. Carbide-tipped saw blades have exceptional fatigue, shock, and wear resistance when cutting difficult-to-machine steels, high-alloy metals, titanium, stainless steel, Inconel, and some exotic metals. A steel backing offers fatigue resistance and makes this blade capable of cutting solid shapes. The Triple-Chip carbide bandsaw blade is used primarily in large manufacturing facilities and steel service centers — where high production output is common — and by anyone requiring tough tolerance and smooth finish. Haltbar’s CT 1002 Triple-Chip bandsaw blade is available in a choice of variable or constant pitch. The variable pitch has variable tooth size and gullet depth to reduce noise levels and vibration. It will remove chips efficiently as a result. The constant pitch has uniform tooth spacing and gullet size for general-purpose cutting. The triple-chip carbide bandsaw ranges from 3/4″ – 2.5/8″ in width, and comes in tooth-per-inch ranges that include .9-1.1,1.4-1.8,1.9-2.1,2.5-3.5, and 3 TPI respectively. The Triple-Chip carbide bandsaw blade is developed to be a standout carbide-tipped saw blade that will outlast bi-metal and carbon blades. 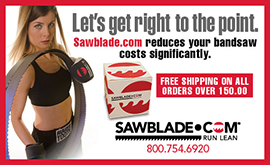 At SawBlade.com, our carbide-tip bandsaw blades feature tooth capping for protection from damage prior to installation and for delivery purposes, to avoid en-route damage in transport. This entry was posted in All Posts and tagged #bandsaws, #SawBlades, Bandsaw, blade, Carbide-tipped, CT 1002, Haltbar, machinists, sawblade.com, Triple Chip, variable pitch, woodworkers. Bookmark the permalink.